Saturday mail delivery - look what just arrived! Off to start packaging it up right now. Spectraflair should be here next week too (is being shipping as we speak with UPS = fast!). Please email me at morenailpolish@iinet.net.au if you want me to hold your envelope to include spectraflair. Please email me quick, otherwise the envelopes will be gone in the post early next week. If you envelope has already been posted and you want spectraflair, delivery will be $2.50. Spectraflair will be $15AUD More details for spectraflair payments will be posted here when it arrives. Have fun! Did u end up paying for customs? No to customs - He had it just under the $1000 threshold for me! Just slow postage from the USA. Can you make a post with all the prices of all the pigments and shipping costs alltogether? Kerstin - will do. Heading off to bed now, but I will do it tomorrow. I have a question regading the SpectraFlair you will be selling. Are we limited to purchasing 1 gram only? 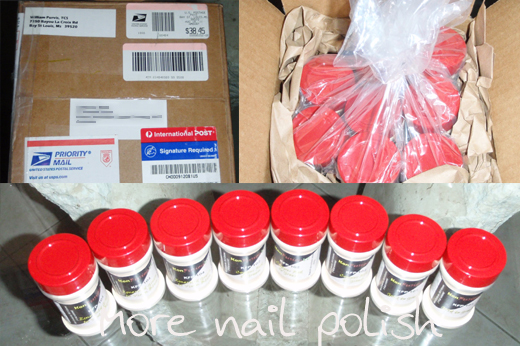 Hey - just wanted to let you know my powders arrived today! Thank you so much for doing all that work to send them out, it is much appreciated!! MK - nah, buy as much as you like. I had to purchase a whole pile of it to make it cheap enough to purchase, otherwise I would be loosing money. I'll send 5 grams for $2.50 postage. If you want more than that let me know. kirstee - so glad it arrived. I'm looking forward to seeing what you create. Do you still have spectra flair and morphing pigment for sale?